Disclaimer: This post is sponsored by The Baby Cubby. When people find out that our family of five has been living car free for almost five years now, they're almost always surprised. With three young kids surely it must be a struggle, right? Of course, there are times when owning a car would come in super handy, like when we decide at the last minute that we want to take a day trip and all of the local Zipcars are already reserved, but in our regular day to day life we get by without a car just fine. Where we live is definitely the biggest factor in how easily we are able to live car free. We live downtown in a fairly bike and pedestrian friendly city where most places we need to go are within a ten to twenty minute walk. School is a ten minute walk away. Karate class is a ten minute walk away. Swim team is a twenty minute walk away. The supermarket is in the bottom of our apartment building. Ok, that last one definitely helps a lot! Pretty much anywhere else we need to go (including Kim's work) can be reached pretty easily by BART (the Bay Area's train system) or bus - both of which are within a ten minute walk of our building. We're lucky that the public transport here is pretty good, but no matter how good a public transport system is, it's always a little trickier to take with small kids in tow. Lugging a stroller up and down bus stairs isn't fun. Neither is folding it up and holding everything, baby/toddler included, when you get a driver who sticks to the (ludicrous!) rules about strollers on buses. Just as bad are the dirty looks from other passengers on busy trains when the stroller takes up a little extra space. And don't get me started on the horrible state of the BART elevators that seem to be commonly mistaken for public restrooms! So, to get around these relatively minor, but still irksome, hassles I try to baby wear as much as possible. This makes it much easier to get on and off buses, we take up less room than we would with a stroller, and, my favorite, we can avoid taking those stinky BART elevators! When it comes to choosing the right baby carrier for your needs it can be a little overwhelming. There are so many different options to choose from and a lot of products on the market. 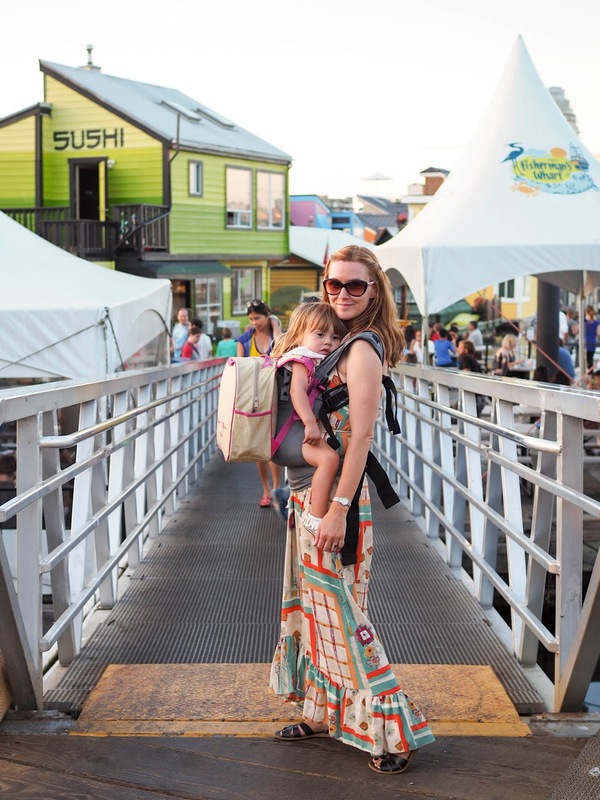 And so many questions... Should you go with a wrap, a sling, or a structured carrier? How do you want to wear your little one? On your front, on your back, forward facing...? Do you need something for extended use into toddlerhood or just for that first year? It can all be pretty daunting, especially when you're a new parent. 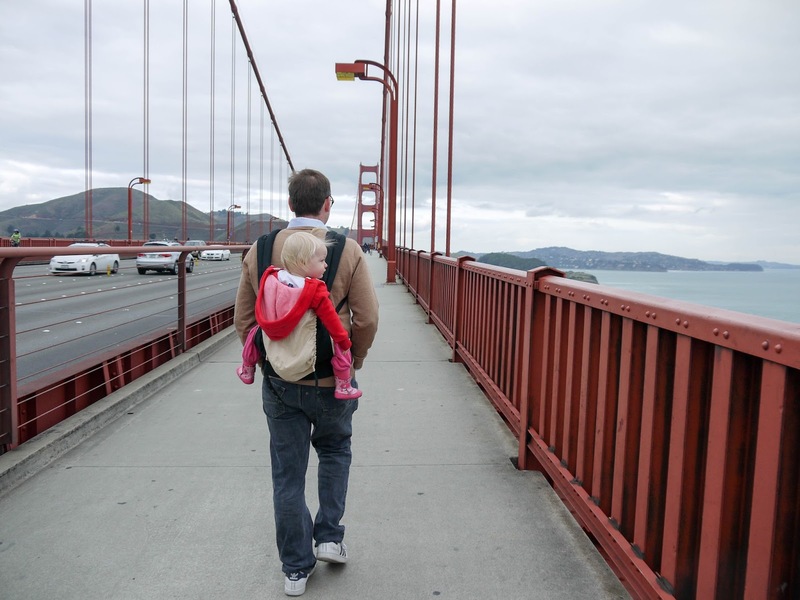 The Baby Cubby, an online (and bricks and mortar) store and resource for all things baby, have an informative baby carrier buying guide that makes finding the right product for your needs easier. You can find this super helpful guide here. For the first twelve months of her life, I carried Mathilde is a stretchy wrap. I had always been interested in trying one with both Ava and Lola but as I'm quite small I figured that a wrap style carrier would be too big for me. Instead I carried both Ava and Lola in a Baby Bjorn front carrier. The Baby Bjorn carrier was a perfect fit for me, but as Lola had outgrown it by her first birthday, I sold it before our big move to America. That meant that when Mathilde came along I was in the market for a new, infant friendly baby carrier. I decided to give a wrap a try and right away I wish I'd had one for my older girls too! It took a little while to get the hang of wrapping it properly, but once I had it down I could put it on in no time. The only drawback to a stretchy baby wrap is that as babies get heavier the wrap stretches more, requiring frequent adjustments. After Mathilde reached her first birthday she was starting to get a little heavy for her stretchy wrap so I looked into other options to continue baby wearing. We have an Ergo carrier that Kim and I had both used with Lola as a toddler, but as I mentioned earlier, I struggle a little when wearing it as it's not quite small enough for me. The straps slip off my shoulders even on the smallest setting and the body of the carrier is a little on the long side for my short torso. It's not so bad for wearing on my back but for front carrying the bottom of the carrier sits too low and makes it hard for me to walk. Kim finds it very comfortable though, so it's the perfect carrier when he's out and about with us. My other issue with the Ergo, is that it is rather bulky to carry around when not in use. 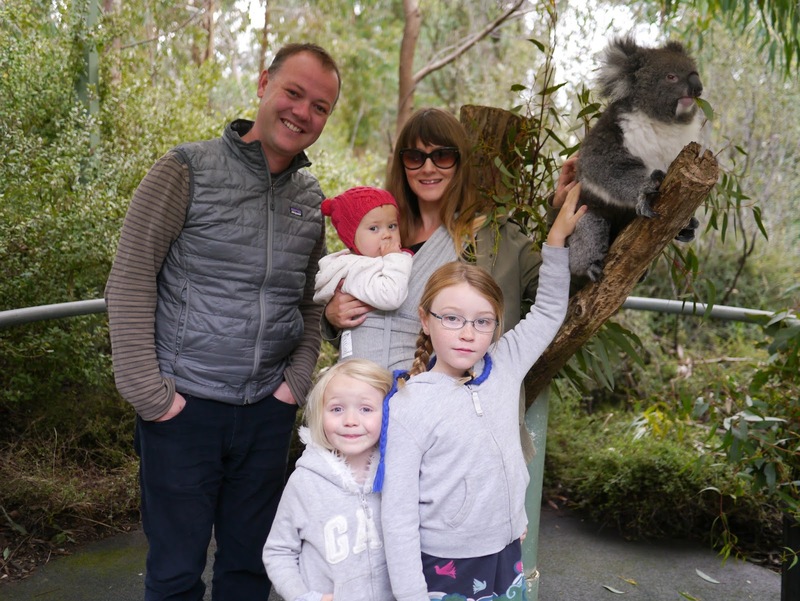 When we visited Australia last Summer I needed a compact baby carrier that I could fit in my handbag, so I purchased a Baby K'tan carrier which folds up quite small. The Baby K'tan is kind of like a ready to wear wrap. It goes on kind of like a t-shirt but looks like a wrap when on. Like a t-shirt, the Baby K'tan comes in sizes for the adult wearer. This meant that I could get an extra small to fit me, but Kim was not able to use it at all, meaning I was left to carry Mathilde for pretty much our entire trip! The Baby K'tan came in really handy for this particular trip, but as Mathilde got a little bigger I felt kind of claustrophobic wearing it for longer periods. As it is comes sized adjustments aren't really possible. The more room Mathilde took up in it, the less room there was for me. With the Baby K'tan no longer working for me, but there still being a need for a compact baby carrier, I needed another option. My most recent baby carrier purchase was a Boba Air carrier. Like the Baby K'tan it folds down small and fits easily into my handbag without taking up too much space. However, rather than being a wrap, the Boba Air is a structured baby carrier along the lines of the Ergo. What makes it compact is that unlike the Ergo, there is no padding for ergonomic wear. This means that it's not quite as comfortable as the Ergo for extended periods of time, but for short term use it's perfectly fine. I can keep it in my bag when we're out and about without the stroller and put it on just when Mathilde gets too tired. Not only is it a practical solution when I'm out and about at home with Mathilde, but it was fantastic during our recent trip to Seattle and Canada. Mathilde insisted on walking everywhere (with her backpack full of books and plush toys) and towards the end of the day when she got tired I just grabbed my Boba Air out of my bag and put her in it - with her backpack over the top! 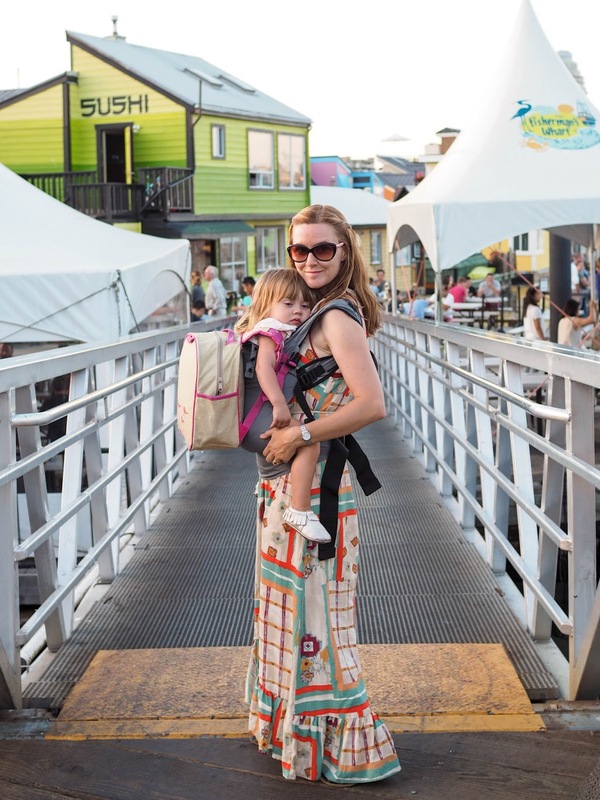 Baby wearing has been both a practical solution for us, and something very comforting for both Mathilde and me. I have loved having her snuggled up close to me and she often sleeps better when I'm wearing her. Not only is it practical when it comes to our public transport needs, but it means that I can hold Mathilde close and still have my hands free to do pretty much everything else I need to do - and let's face it, us mums are almost always multi tasking! If you're thinking about baby wearing make sure to check out the baby carrier buying guide from The Baby Cubby for more tips. You can find it here: http://www.babycubby.com/baby-carrier-buying-guide Make sure to check out their great range of baby products including baby carriers too.